One of my concerns (and also a concern of some of my mentors and academic idols) as a journalism historian is how to refer to the loosely organized group of not-quite-professional people who take it upon themselves to organize a day’s events into what we call news. It grates on me when I hear news organizations and news people lumped into an undifferentiated, and yet somehow still subjective and intentional mass called “The Media.” At the very least, I would say that the subset of The Media who produce news should be considered apart (at least most of the time) from the broader media that bring us movies and music and sports and entertainment and whatnot. I prefer the term “The Press” for these people, despite the fact that most of the people and organizations that I would now define into this category are more likely to use WordPress than an actual printing press (and not just because The Press is the title of A.J. Liebling’s compilation of press criticism). There are still problems, of course, with lumping together newspeople and news organizations into something akin to a cabal, but that’s not the point of this post. 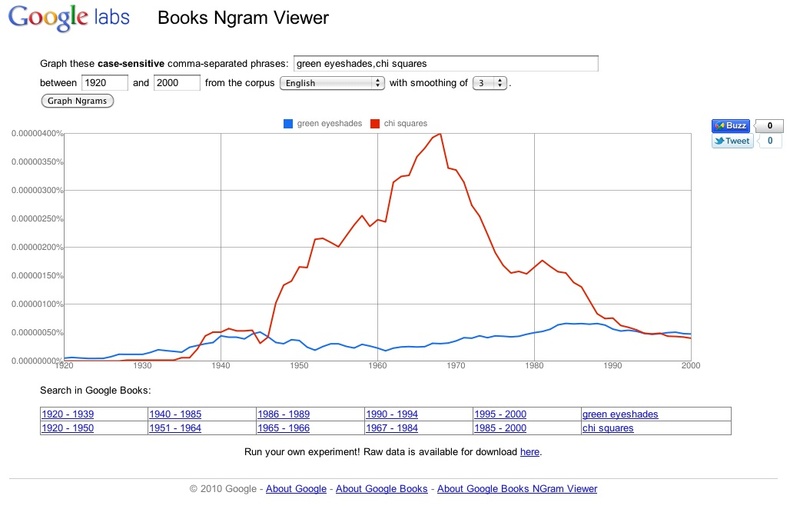 The point of this post is to mess around with Google’s Ngram viewer, which plots two or three words or phrases against each other in terms of frequency of usage in a database of (unidentified) books that Google has scanned into its servers. I wanted to throw in a few press/media/journalism history terms in there and see what came out. Like the underlying worldview of “objective” journalism, it’s not scientific, but it feels sciencey. 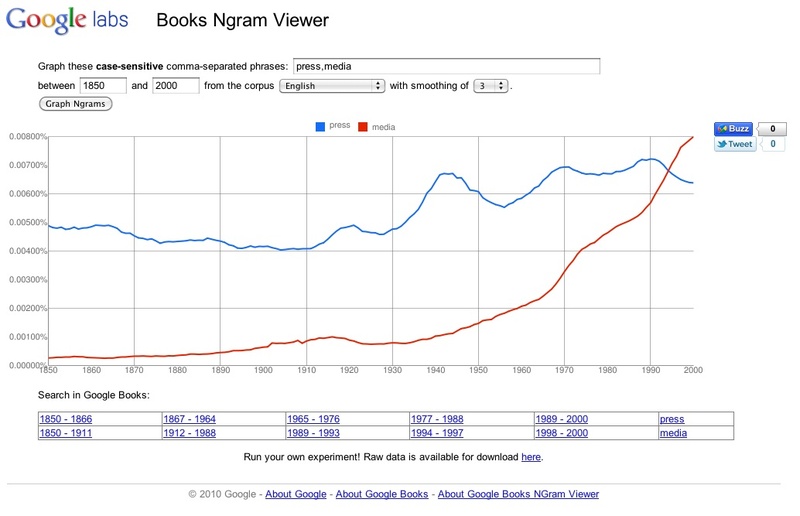 Unsurprisingly, “media” doesn’t begin to make much of an appearance before the turn of the 20th Century, though I wouldn’t have expected it to be an issue at all until midcentury, which is when it starts its ascendancy, passing “press” somewhere in the mid-’90s. Not much change in proportions there. 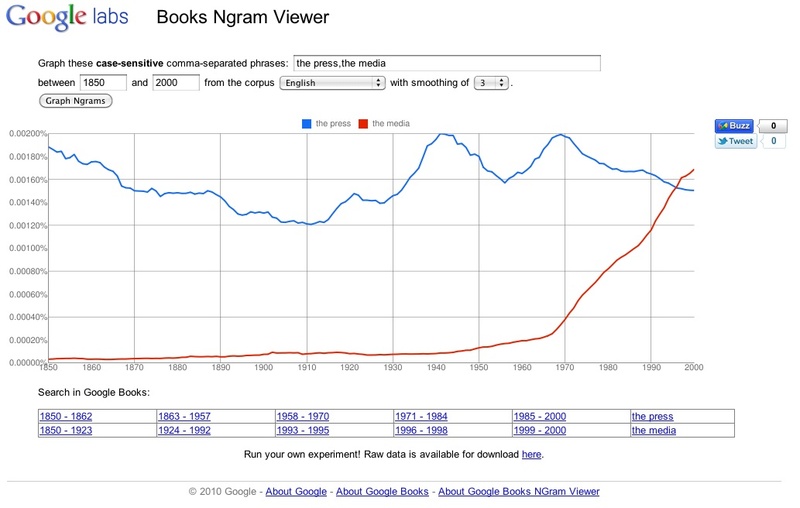 So “the media” has really only dominated, at least in Google’s book-based sampling, in the last 15 years. What to make of it? I don’t know. While “reporter” has (almost) always had a slight edge, “journalist” was not far behind, beginning as early as the rise of the Penny Press in the 1830s. 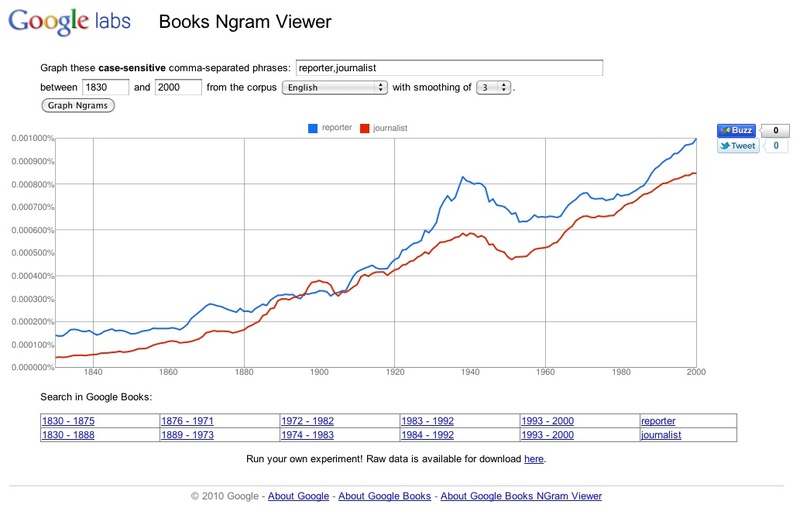 Both are still in their ascendancy, apparently, too, which could be solace to my graduating seniors, but could also just be the result of bellyaching about “the lack of jobs for journalists.” There seems to have been a surge in writing about journalists and reporters in the ’30s and ’40s, which isn’t all that surprising. 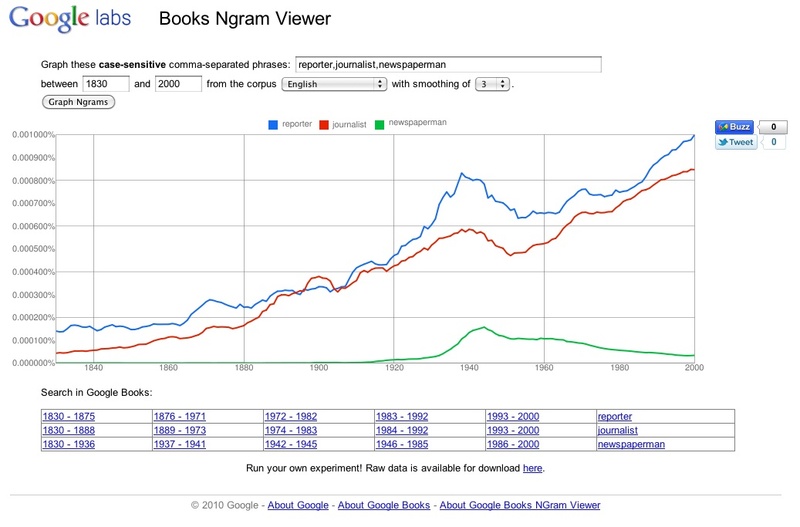 The one other interesting bump is the one that propels “journalists” over “reporters” in the late 1890s and early 1900s, and this is where Ngrams is frustrating, because as a historian, I want to dig into the particular texts that briefly made “journalist” the preferred term of art. It really begins to decline around 1960, which seems about right to me on its face. What surprised me though is that the term was virtually nonexistent until the 1930s. I would have thought it far predated that. So what conclusions can we draw from this graph? Honestly, like all of the graphs in this post, none. But we can at least pretend to say that the social scientists had their day from the 1950s to the 1980s, and that those of us who think about and analyze media without relying entirely on numbers can take some solace in the way that little blue line overtakes that little red line right about the time I started my college education, and when I first started working for my college newspaper.